This article is about a Sanskrit word and a virtue in Indian religions. For wife of Hindu god Krishna, see Nagnajiti. For other uses, see Satya (disambiguation). 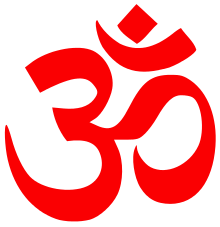 Satya is an important concept and virtue in Indian religions. Rigveda, dated to be from the 2nd millennium BC, offers the earliest discussion of Satya. 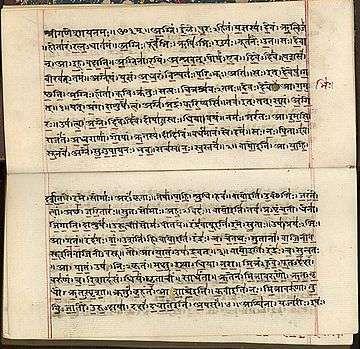 It can be seen, for example, in the fifth and sixth lines, in above Rigveda manuscript image. Satya is the Sanskrit word for truth. 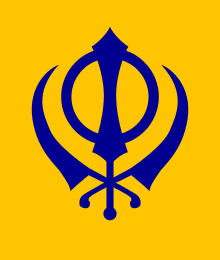 It also refers to a virtue in Indian religions, referring to being truthful in one's thought, speech and action. In Yoga, satya is one of five yamas, the virtuous restraint from falsehood and distortion of reality in one's expressions and actions. In the Vedas and later sutras, the meaning of the word satya (सत्य) evolves into an ethical concept about truthfulness and is considered an important virtue. It means being true and consistent with reality in one's thought, speech and action. A related concept, sattva, also derived from "sat", means true essence, nature, spiritual essence, character. Sattva is also a guṇa, a psychology concept particularly in the Samkhya school of philosophy, where it means goodness, purity, clean, positive, one that advances good true nature of self. 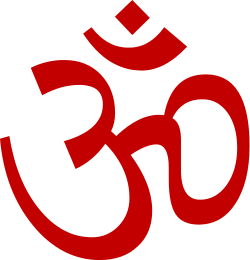 Satya is a central theme in the Vedas, states Hindery. It is equated with and considered necessary to the concept Ṛta (Sanskrit ऋतं ṛtaṃ) – that which is properly joined, order, rule, nature, balance, harmony. Ṛta results from Satya in the Vedas, states Holdrege, as it regulates and enables the operation of the universe and everything within it. Satya (truth) is considered essential, and without it, the universe and reality falls apart, cannot function. In Rigveda, opposed to rita and satya are anrita and asatya (falsehood). Truth and truthfulness is considered as a form of reverence for the divine, while falsehood a form of sin. Satya includes action and speech that is factual, real, true and reverent to Ṛta in Book 1, 4, 6, 7, 9 and 10 of Rigveda. However, Satya isn't merely about one's past that is in context in the Vedas, it has one's current and one's future contexts as well. De Nicolás states, that in Rigveda, "Satya is the modality of acting in the world of Sat, as the truth to be built, formed or established". Nothing is higher than the Law of Righteousness (Dharma). The weak overcomes the stronger by the Law of Righteousness. Truly that Law is the Truth (Satya); Therefore, when a man speaks the Truth, they say, "He speaks Righteousness"; and if he speaks Righteousness, they say, "He speaks the Truth!" For both are one. Taittiriya Upanishad's hymn 11.11 states, "Speak the Satya (truth), conduct yourself according to the Dharma (morality, ethics, law)". Translation 1: Truth alone triumphs, not falsehood. Sandilya Upanishad of Atharvanaveda, in Chapter 1, includes ten forbearances as virtues, in its exposition of Yoga. It defines Satya as "the speaking of the truth that conduces to the well being of creatures, through the actions of one's mind, speech or body." Deussen states that Satya is described in the major Upanishads with two layers of meanings - one as empirical truth about reality, another as abstract truth about universal principle, being and the unchanging. Both these ideas are explained in early Upanishads, composed before 500 BC, by variously breaking the word satya or satyam into two or three syllables. In later Upanishads, the ideas evolve and transcend into satya as truth (or truthfulness), and Brahman as the Being, Be-ness, real Self, the eternal. The Shanti Parva of the Mahabharata states, "The righteous hold that forgiveness, truth, sincerity and compassion are the foremost (of all virtues). Truth is the essence of the Vedas." The Epic repeatedly emphasizes that Satya is a basic virtue, because everything and everyone depends on and relies on Satya. To speak the truth is meritorious. There is nothing higher than truth. Everything is upheld by truth, and everything rests upon truth. Even the sinful and ferocious, swear to keep the truth amongst themselves, dismiss all grounds of quarrel and uniting with one another set themselves to their (sinful) tasks, depending upon truth. If they behaved falsely towards one another, they would then be destroyed without doubt. In the Yoga Sutras of Patanjali, it is written, “When one is firmly established in speaking truth, the fruits of action become subservient to him." In Yoga sutra, Satya is one of the five yamas, or virtuous restraints, along with ahimsa (restraint from violence or injury to any living being); asteya (restraint from stealing); brahmacharya (celibacy or restraint from sexually cheating on one's partner); and aparigraha (restraint from covetousness and craving). Patanjali considers satya as a restraint from falsehood in one's action (body), words (speech, writing) or feelings / thoughts (mind). In Patanjali's teachings, one may not always know the truth or the whole truth, but one knows if one is creating, sustaining or expressing falsehood, exaggeration, distortion, fabrication or deception. Satya is, in Patanjali's Yoga, the virtue of restraint from such falsehood, either through silence or through stating the truth without any form of distortion. The term satya (Sanskrit; in Pali: sacca) is translated in English as "reality" or "truth." In terms of the Four Noble Truths (ariyasacca), the Pali can be written as sacca, tatha, anannatatha and dhamma. 'The Four Noble Truths' (ariya-sacca) are the briefest synthesis of the entire teaching of Buddhism, since all those manifold doctrines of the threefold Pali canon are, without any exception, included therein. They are the truth of suffering (mundane mental and physical phenomenon), of the origin of suffering (tanha 'pali' the craving), of the extinction of suffering (Nibbana or nirvana), and of the Noble Eightfold Path leading to the extinction of suffering (the eight supra-mundane mind factors ). The Gurmukhs do not like falsehood; they are imbued with Truth; they love only Truth. The shaaktas, the faithless cynics, do not like the Truth; false are the foundations of the false. Imbued with Truth, you shall meet the Guru. The true ones are absorbed into the True Lord. The motto of the republic of India's emblem is Satyameva Jayate which is literally translated as 'Truth alone triumphs'.